Earlier in March, Facebook had acquired a video filter app, MSQRD. The social networking company is in plans to make use of the acquisition. It is testing a new feature that will allow the users to add filters to their selfies. The feature that puts the camera at the top of the newsfeed is currently under testing for users in Brazil and Canada. Facebook is providing this feature with the Olympic themed filters to the users in Canada and Brazil. This is much similar to the feature in Snapchat. Just like in Snapchat, you will find the face-altering lenses and filters that you can cover on top of the photos that you capture. A few days ago, Facebook-owned Instagram introduced another feature Instagram stories, that is much similar to the one in Snapchat, Snapchat stories. 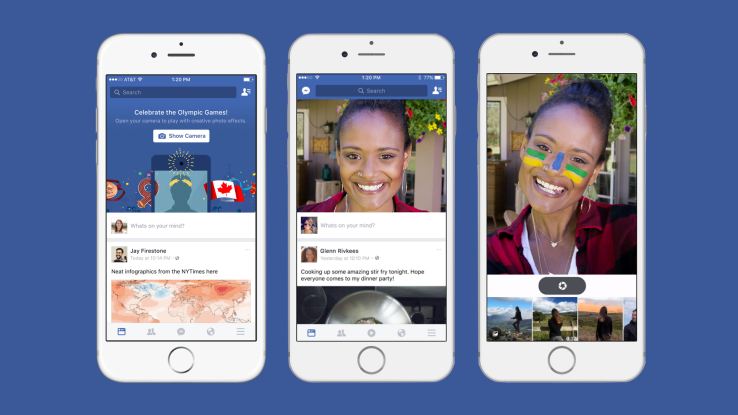 Facebook is testing the new selfie feature only on iOS and Android platforms in Brazil and Canada. Let us know whether you liked this feature in the comments section below. We’d love to hear from you.